At long last, and you all can’t possibly imagine my level of anticipation on this one, the second installment of the Legend series has finally arrived. What’s even worse is that life got in the way over the past week so it took me several days to read vs. the 1-2 that it would usually take for a book that i’m this excited about. All that being said, Marie Lu hasn’t disappointed and the story was amazingly well written and really held my interest. As can be expected – nothing is ever cut and dry. Upon arrival to Vegas, they find that the Elector Primo has died and his son Anden is taking over. Day and June manage to cross paths with Kaede who they learned was part of the Patriots in book 1 and she helps them get medical care for Day who was injured in the escape as well as help develop their path and future roles. Kaede takes them to meet Razor who is the ‘leader’ of the Patriots who has a plan to assassinate the Elector and feels that June is the best person to lure him into position since she has met Anden, is the Prodigy of the Republic and well, Anden has a thing for her. Day it’s decided will be the one to actually kill the Elector, and June and Day agree to this deal only because they have no other choice in freeing / finding Eden and getting themselves to the Colonies. So this is where the story goes, twists/turns and develops. One of the things that i LOVE about the writing is that throughout the story, June’s perspective remains on of extreme awareness – she’s always taking in the details of her surroundings like she’s preparing for Plan B. she’s always therefore aware of when people are telling her the truth and when something just doesn’t seem right. This is where she’s really useful since she learns things about the Republic/Anden and The Patriots/Razor that really impact her decisions. Day on the other hand has his mind set on things, knows what he has to do to get to his brother, but realizes that he has real feelings – feelings of love for June that somewhat complicate things for him. Tess…not she comes back in a way that i hoped would happen yet i wasn’t sure if would . See, from the weeks that she was separated from Day, she seems to have come into her own, grown up a little, and of course decided that she’s got this crush on Day. when they reunite, the thing between Day and June complicates things further for her. so…this story is full of excitement while we’re watching what unfolds for June in her role w/ Anden, Day as we see what he has to do for both his own sake and for Junes….as well as deciding who we should really believe and trust. 2) will Anden survive and what will he do if he does? 3) What is June going to decide- what side is she on? 4) What’s Day’s role in everything and what is he going to do with his personal relationships? 5) what’s the deal with Razor – will he get what’s coming to him? 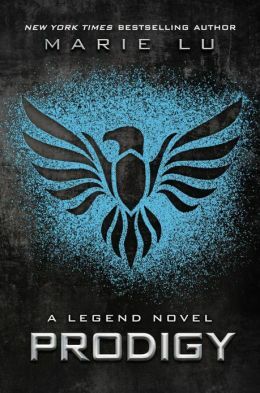 This entry was posted in Dystopian, Reviews, Young Adult and tagged Day and June, Dystopian, Legend, Legend Series, Marie Lu, Prodigy, YA lit by iscm13. Bookmark the permalink.